Noida: 7th Amity International Moot Court Competition 2017 organised by Amity Law School, Noida concluded today with the team from Institute of Law, Nirma University, Gujarat declared as Winners during the Valediction Ceremony held at Amity Campus, Sector-125, Noida. Moot Court is one of the primary modes of clinical legal education which aims to inculcate in law students a capacity to think on feet. 7th Amity International Moot Court Competition 2017 was third paperless Moot organized by Amity Law School. This year, the theme was based on the established principles of World Trade Laws, which provided participants with a panorama of unconventional and extraordinary legal issues to delve upon. Over 30 Law Colleges and Institutions participated in the competition including Chanakaya National Law University, Patna, K.R. Mangalam University, Dr. Ram Manohar Lohiya National Law University, Symbiosis Law School, Noida, The Tamil Nadu Dr. Ambedkar Law University, Chennai, Army Institute of Law, Mohali, National Law Institute, Bhopal, University Institute of Legal Studies, Punjab University and others. 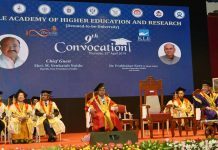 The Semi-finals were contested between School of Law, Christ University; Gujarat National Law University, Institute of Law, Nirma University and NLIU, Bhopal. 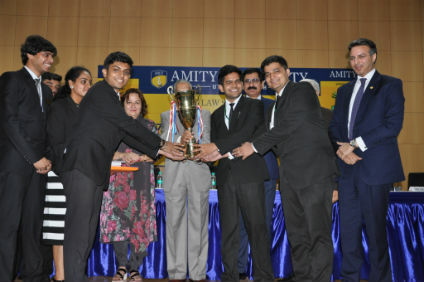 The finals were contended between School of Law, Christ University and Institute of Law, Nirma University. The team from School of Law, Christ University, Bangalore was declared Runner-up Team and Institute of Law, Nirma University, Gujarat received Best Memorial Award. Ms. Sofia Padmanabhan from The Tamil Nadu Dr. Ambedkar Law University, Chennai was declared Best Speaker and Ms. Mala from Law Centre II, Faculty of Law, Delhi University was awarded as Best Researcher. Hon’ble Justice R.K. Aggarwal-Sitting Judge of Supreme Court of India, Ms. Pinky Anand -Additional Solicitor General of India, Justice Mr. Sanjeev Sachdeva , High Court of Delhi, Former Justice Rakesh Tiwari – Calcutta High Court and Dr. Atul Chauhan- Chancellor, Amity University graced the valediction ceremony and felicitated the winners. Sharing his views, the Chief Guest Hon’ble Justice R.K. Aggarwal-Sitting Judge of Supreme Court of India stated that Law students have an important role to play in democracy and therefore, it is important for them to prepare themselves well for future. He encouraged Law students to participate in Moot Court Competitions since mooting is not a mere resume enhancing activity but it nurtures the art of advocacy, strategic thinking, structuring arguments in a coherent manner, teamwork and leadership skills in law students and most importantly, it helps them to develop their own principles and way of persuasion, which cannot be learnt in classrooms. He congratulated Amity Law School for organizing paperless Moot and shared that the efforts are on to make all Indian Courts completely paperless in future. Addressing the students, Ms. Pinky Anand -Additional Solicitor General of India stated that there are over 1300 Law Schools in the country and 13 lakh lawyers, therefore, to be amongst the top Lawyers of the country, the law students have to develop the art of new critical analysis and a different way of looking at things. Dwelling on the sub-theme of the moot, she stressed that Development V/s Environment is a perpetual debate in the countries, to which nobody has an answer. She remarked that in developing countries, to what extent the courts should intervene in this sensitive debate, is still to be decided. She opined that it is on youth of the country to decide between Development and Environment and as a Nation, we need to decide what role we want to perform in the globalised world. Complementing the participants, Dr. Atul Chauhan- Chancellor, Amity University expressed his conviction that all the budding lawyers who participated in the Moot Court competition will become exceptional and successful lawyers in future since they have learnt the art of investing in their own selves and enriching their intellect every day. He remarked that he can see a spark in the eyes of the participants and each one of them will achieve their dreams and goals in future. Justice Mr. Sanjeev Sachdeva, High Court of Delhi, while addressing the students stated that Legal Profession is called noble because lawyers help the people in need; they are considered knowledgeable and people look upon them for advice and opinion. He remarked that after the completion of the law programme and becoming a Lawyer, there is no investment needed by the Lawyer; he/she can start earning right away. The important and judicious investment of time and money is needed during the 5 year programme, the better investment will lead to better returns for the students. Advising the students, he expressed that numerous quick rich opportunities will knock their way during the profession, but a Judge will always respect a good and an honest lawyer. He remarked that if the reputation of a lawyer goes down, he will never go up in his profession. He motivated students to become honest and ethical lawyers and fight for the righteousness. The teams were judged by the sitting judges of the Hon’ble Supreme Court and the Delhi High Court including Mr. Pankaj Bhatia, Senior Advocate, Mr. Pushkar Mehrotra. Senior Advocate, Mr. Kavin Gulati, Senior Advocate, Mrs. Rachana Srivastava, Senior Advocate and Mr. Dhruv Wahi- Senior Advocate and others. Also present during the occasion were Dr. D.K. Bandyopadhyay- Chairman, Amity Law Schools, Prof. Balraj Chauhan- Director, Amity Law School, Lucknow, Dr. Aditya Tomer, Additional Director (HOI), Amity Law School, Noida and Dr. Shefali Raizada, Additional Director (HOI), Amity Law School, Noida.